Vampires, beware! 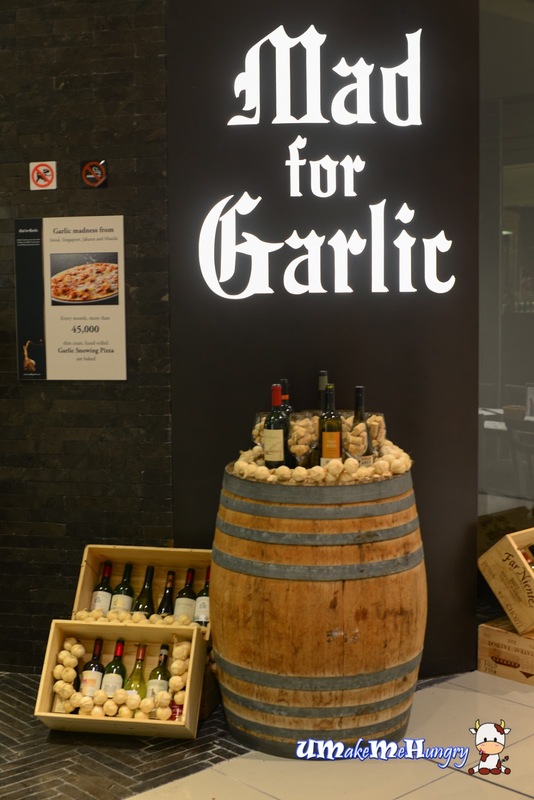 Mad for Garlic is re-opened on 1st July 2013 after its re-vamp in Suntec City Mall. 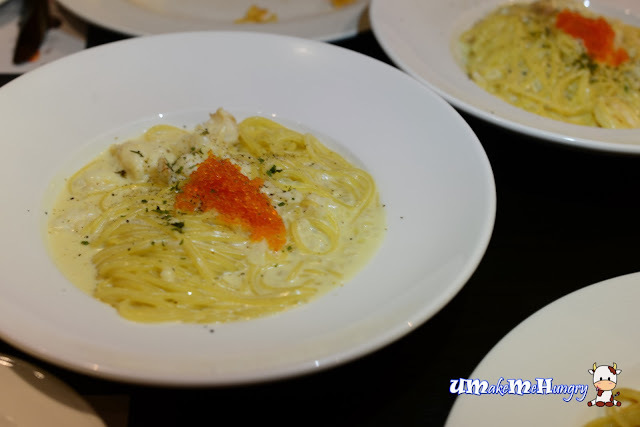 Originated from korea, Mad for Garlic is one of korean's popular chain restaurants known for its Garlic-Specialized Italian dishes. Not only that if you are a Wine lover, this is for you as Mad For Garlic did provide an extensive wine menu. Look at the neatly placed bottles of wine on the left. With Garlic as the main theme, I could never fail to miss out garlic as part of their interior decorations. 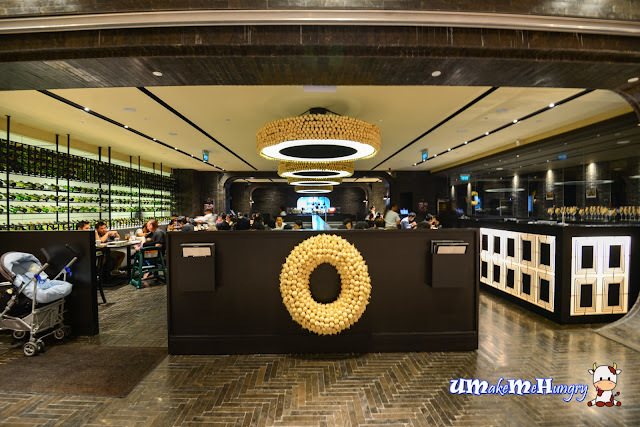 A big garlic wreath was left hanging at its main entrance and seen surrounding its big lamps at the middle of the restaurant. 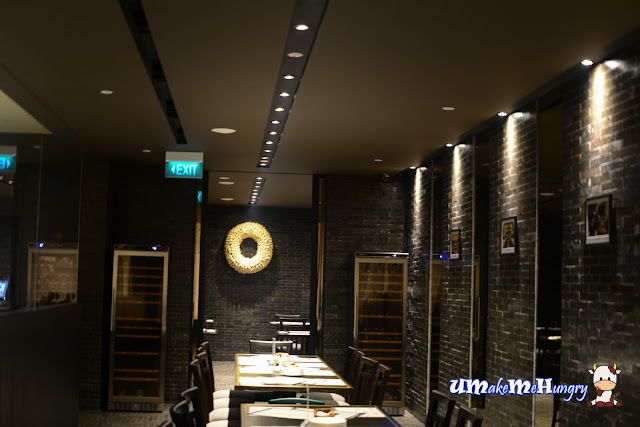 The entire environment had brought out a good European Rustic ambiance with its sleek black and white design with zigzag tiles. There were two sections in the restaurant, the one that we had seen earlier on was its main and looked brighter. As we were dining in a group about 10 with a kid, we were direct into a private area in the restaurant. This place had separated the main dining with a big glass panel, dimmer but cosy. The down side was that it was not easy for us to grab attention from the servers. Parents need not worry about their kids, Mad For Garlic has excellent place for you to park your prams in front of their shop. Opted for Garlic Cream Based over Tomato. 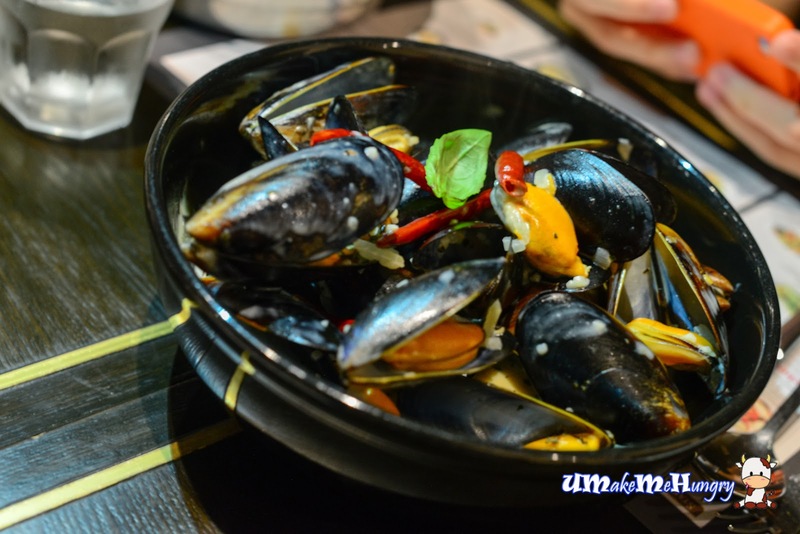 These Fresh Mussels were served with assorted pepper and tastes tad spicy with its dried chilli padi.Chopped garlic was heavily added to eliminate the natural's stink from mussels. Probably the best food ordered for the night. 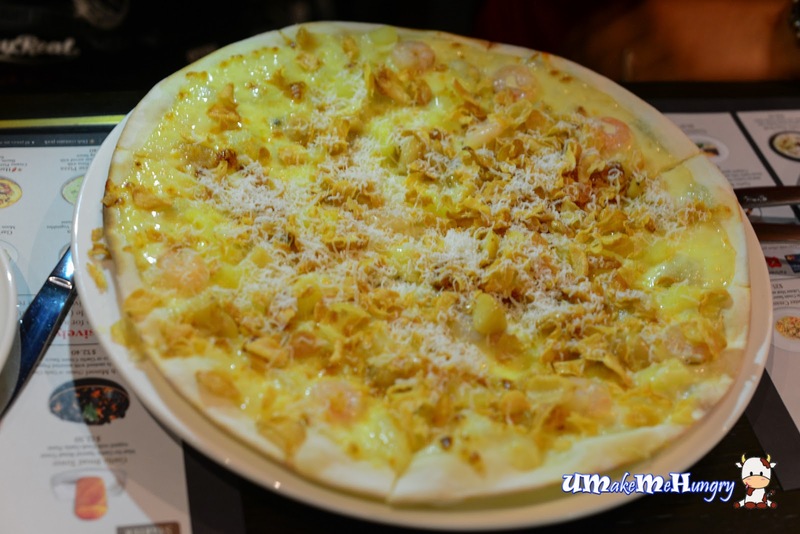 Garlic Snowing Pizza was cream-based topped with sweet garlic, diced pineapples and shrimps with cheese. It had a unique favour that gave a good first impression and I like its thin crust together filled with shaved cheese. A nice try for Snowing effect. Rich Creamy Garlic Sauce Pasta anyone? Served with springy bite size lobsters and orange fish roes. Simply love these different kinds of textural bite on the palette. 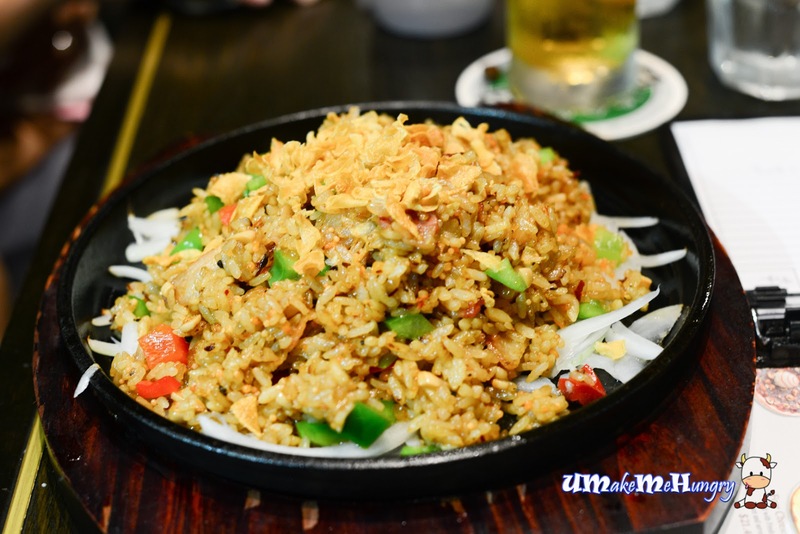 Garlic Fried Rice with Garlic Pickles, Bacon and Fish Roe. Ingredients like green and red pepper, onions was added. Each grain of risotto was aromatic, tasted full of flavour. This dish somehow relate me to the english version of "Yang Zhou Chao Fan "扬州炒饭". 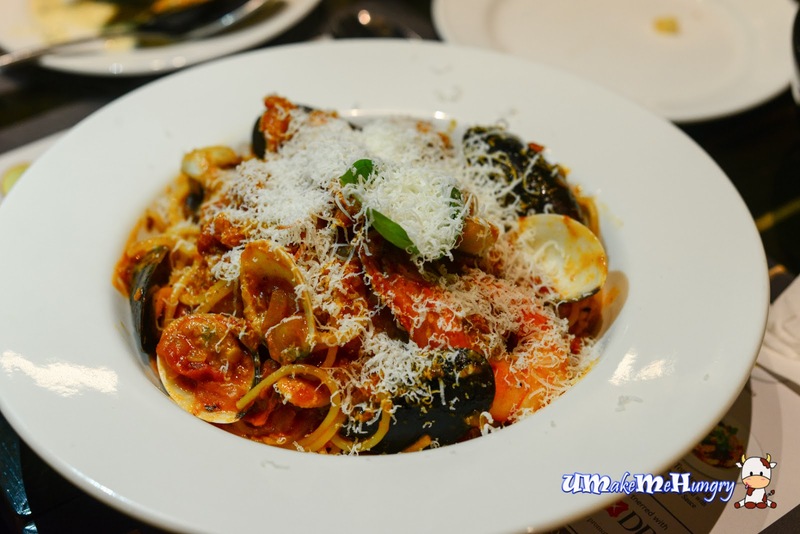 Fresh Seafood Pasta was filled with original Italian Tomato Sauce as well as shaved cheese that covers up the entire dish. 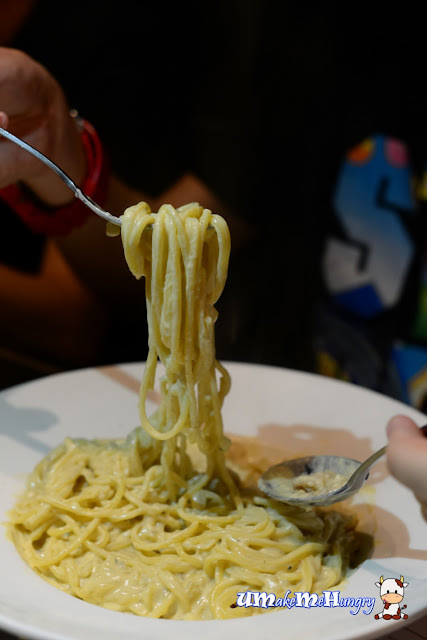 Carbonara with Bacon in Herb Garlic Cream Sauce was too creamy to my liking. Advisable to be consumed before it turned cooler as it tastes abit chalky after sometime.